Synopsis: Nate and Zoe are glaciologists conducting research on the rate of ice flow in a remote outpost on Broadmore Glacier, Alaska. While the ice beneath them moves at unprecedented speed, their marriage is in crisis. Roger, a PR exec from the company who funded their research grant, arrives to get footage of the project. Meanwhile, the trio is being watched by Trapper Max, an old woman with a secret and a penchant for showing up at inopportune times. After Nate falls and breaks his leg, Max “rescues” him… or does she? The Memory of Ice is a wild ride — full of unexpected moments, awkward emotions, and inconvenient changes. It asks—how do we live a life of hope and see beauty in the face of continually changing conditions? 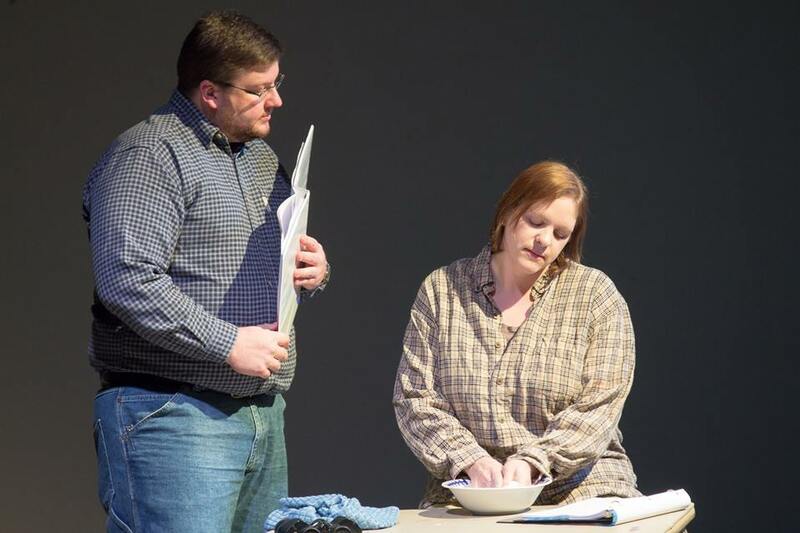 Above: Lee University Writer's Festival, 2015, directed by Lisa Neely. Cast: Kim Jackson, James Williams, Will Jayroe, Christine Williams, and Jared Cole. Cellists: Lisa Phillips and Lacey Thwing. Photos courtesy of Austin Gunter.